A fascinating look at grape varieties and wine regions from around the world, from the vineyards and wine cellars of Ancient Egypt, Greece and Rome to the old and new worlds of wine today. 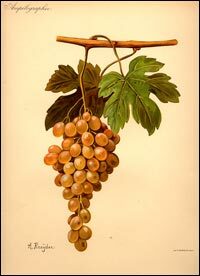 A highlight is exquisite coloured illustrations of grape varieties from 19th century French resources. Germination of a seed, enlarged, its embryonic root, stem, cotyledons and bud. The embryonic bud alone, at the four-leaf stage of development. Adventitious roots, originating particularly from swellings of the stem or portion of the stem kept in a damp and dark environment. Part of the bud stem in its first stage of development. The same showing gradual development of the bud. Young branch with alternate stipulated leaves. The same, at a later stage of development; alternate stipulated leaves; towards the top, nascent clusters and tendrils. Leaf, stipules, petiole and lobed blade with palmate venation. Part of a young cluster. Tendril emergingresulting from the other part of the same aborted cluster. Tendril emergingresulting from a completely aborted cluster. Portion of a leaf enlarged to show its venation. Part of a composite cluster (natural size) showing some open flowers and some still sheathed. Part of the same cluster enlarged showing some bracts. Bud (very enlarged); below, the pedicel; above, a widening formed by the short tube of joined sepals; higher up, the obovoid body formed by the five petals visible by their curving edges. The same bud opening up; below, the pedicel; above, the short tube of the joined, lasting and fixed sepals (completely in this species); higher up inside, the five filaments surmounted by their anthers; above the latter, the five petals detached from their base, still visible at the top, hidden in their lower part, which stands up by twisting upwards; inside at the base of the filaments and alternate with them five nectaries surrounding the base of the ovary; finally in the centre the ovary. External view of the same petals. Internal view of the same petals. The same, upside down, reduced by half (vertical section). Flower, still slightly enlarged, without its petals. Stamen, greatly enlarged, internal view; the two carpels closed. The same, the two carpels open. External view of the same; the filament terminating in the middle of the dorsal face. The ovary (enlarged to the same degree as the stamens) having, behind it, nectaries, filaments without anthers, sepals and peduncle. Joined stigma seen from above. Transverse section of the ovary formed from two carpels with reflex edges, thus forming two sections; two seeds in each section. Longitudinal section of the same ovary. Longitudinal section of the almost ripe ovary, dorsal view; at the top the stigma and short joined marcescent styles; below, the carpels; the median line marking the partition of the reflex edges, the aborted or semi-aborted seeds in one of the sections, the endocarp established by two lines on each side of that marking the partition, the mesocarp being in the space between the endocarp and the outer line (the exocarp) which determines the shape. Ripe ovary or fruit (natural size); part of the external casing (exocarp) having been removed, revealing the external tissue of the mesocarp. Longitudinal section of the same revealing the layers (exoderm, mesoderm and endoderm), the large albumen and in the lower part the small upright embryo. The following grape varieties have been selected after consideration of their major significance in world viticulture, their contribution to world-renowned wines, their significance in Australia, and their current popularity and/or increasing use in Australia. None, although the variety is often qualified by the addition of the name of the region, as in Barbera dAlba, Barbera dAsti, Barbera del Monferrato etc. There are several variations in the clones. 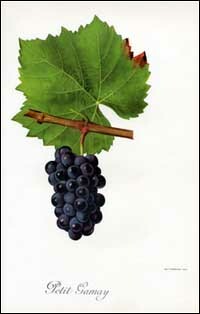 Barbera is the most widely grown red wine grape of Italy, and the variety was known to exist in the thirteenth century. It is believed to have originated in Piedmont near Monferrato and then spread through the rest of Italy. In Australia it has been grown since clones were imported from the University of California, Davis, in the 1960s. Barbera is to be found mostly in Italy especially in the region of Piedmont though it is also to be found in Central and Southern Italy. There are significant plantings in California especially in the Central and Napa Valleys and it is also to be found in Argentina, Brazil, Dalmatia and Uruaguay. There are only small plantings as yet in Australia, though it has been grown for approximately 25 years in the Mudgee region of New South Wales, with later plantings in the King Valley and the Mornington Peninsula in Victoria. The vine is fairly vigorous and high yielding particularly if grown in a warm to hot environment with suitable soils, but it is susceptible to several diseases. The leaves are medium in size, flat, 5-lobed with a hairy lower surface. The bunches are of small to medium size and usually conical, winged and compact. The berries are of medium size, black, oval in shape and bear a heavy bloom. They are late ripening and generally have soft skins. The juice has a good colour, high levels of acid and tannin, with a fruity, floral nose and a distinctive varietal palate. While the wine produced is usually drunk early it will also age well. Barbera is used in Italy to make dry red wines and also sweet red and sparkling red wines.. There are only two DOCs for varietal Barbera and it is more usually blended with a varying percentage of other red varieties because of Barberas somewhat neutral palate. Similar methods of wine making are used in all the regions in which it is cultivated and therefore the same variety of styles is presented, but it is generally most valuable as a blending wine. None in Australia. In France Cabernet Franc is also known as Cabernet Gris, Grosse Vidure, Bouchet (St. Emilion and Pomerol), Carmenet (Médoc) and Breton (Loire). In Italy it is also known as Bordo (Veneto). Cabernet Franc was recognised in the Bordeaux area by the end of the eighteenth century near Libourne, then in the Médoc moving up to the Loire. It was found in Northern Italy in the early nineteenth century, becoming especially important in North-Eastern Italy. It was introduced into Australia in James Busbys 1832 Collection. In France Cabernet Franc is to be found in the Loire Valley, especially in the areas round Chinon and Bourgueil, in the Bordeaux area especially on the right bank of the Gironde round St. Emilion and Pomerol. It has now been named as a recommended variety for planting throughout France. In Italy the most significant plantings are in North-Eastern Italy and it is a particularly important component of the wines of Friuli, Venezia, Giulia and the Veneto, but it is grown as far south as Apulia. The variety is also common in Eastern European countries such as Yugoslavia and Hungary and also in Chile. In Australia plantings are small, but are to be found in North-Eastern Victoria and South Australia particularly in the Clare Valley. The vine is very vigorous and upright in growth. The leaves are medium in size, broad and usually 5-lobed. The upper surface is a darkish green and shiny, the lower surface is slightly hairy with prominent veins. The bunches are small to medium in size, elongated, slightly conical in shape with two wings. The berries are small, loose, round but irregular, blue-black in colour and covered in bloom. They are early-ripening, with a fairly thin skin and are juicy. Cabernet Franc produces a wine with acid, tannin and good varietal character. It is aromatic and spicy, berry-flavoured and earthy on the palate and colours with age. In France the juice is of particular importance in the Bordeaux region, where it is blended with Merlot in St Emilion and Pomerol and with Cabernet Sauvignon and Malbec in Médoc and Graves. Elsewhere it may be blended with Carignan in the Midi, with Malbec in the Loire, with Tannat in Basses Pyrénées and in Italy it may be blended with Sangiovese in some Chiantis. In Australia Cabernet Franc is used to produce a good quality varietal wine and may be blended with other varieties such as Cabernet Sauvignon and Malbec to produce a Bordeaux-style wine. None in Australia, but in France also known as Petit Cabernet, Vidure, Vidure Sauvignonne, Petit Bouchet etc. This grape variety is not to be confused with Cabernet Franc. Cabernet has its origins in the Médoc, Graves, and Gironde region of South-West France. It was possibly known in Roman times, but was certainly recognised by the beginning of the eighteenth century. Cabernet probably arrived in Australia in 1832 in the collection of James Busby, but it is possible that it may have been brought in with the First Fleet by Governor Arthur Phillip, and it is mentioned by Sir William Macarthur in his description of varieties recommended for cultivation in Australia. It was introduced into South Australia by Joseph Gilbert in the 1840s for plantings at Pewsey Vale. Cabernet Sauvignon is still the dominant red grape variety in the Bordeaux region of France. It is now grown successfully in many other countries including the United States of America, especially California, Argentina, Chile, South Africa and Australia. In Australia the most significant plantings are to be found in South Australia (especially Coonawarra, McLaren Vale and the Barossa Valley), Victoria (especially the Yarra Valley), New South Wales and Western Australia (especially Margaret River). The vine has an upright, leafy growth with deeply indented, distinctive 5-lobed glossy leaves which have a downy mauve-coloured underside. The flowers are produced comparatively late and the berry yield is regular but usually low. The bunches are small, conical and often winged. The berries are small, loose, round, thick-skinned, blue-black in colour and covered in bloom, producing juice with a strong varietal flavour. With its wide distribution throughout the world wine-growing areas, the style of the wine produced from Cabernet Sauvignon grapes will vary according to the climate, soil and winemaking techniques used. The wine usually has a complex bouquet and a perfumed, rich, capsicum, multi-berry fruit palate which is often astringent, possessing tannin and needing slow maturation. The juice from the Cabernet Sauvignon grape may be used in the production of rosé wine, as in the famous Anjou Rosé of France, it may be made into a sparkling red wine and it is often blended with other grape varieties such as Cabernet Franc, Merlot, Malbec and Petit Verdot in the great wines of Bordeaux in South-Western France and especially with Shiraz in Australia. 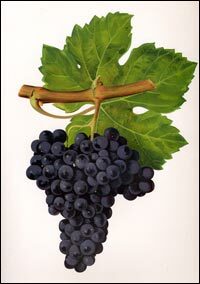 In France this variety is also known as Carignane noire, Crignare or Plant dEspagne. In Spain it is also known as Tinto or Cariñena, and in Italy as Carignano. In Australia the variety known as Carignan is in fact usually the Portuguese variety Bomvedro or Bonvedro. The variety originated in Spain probably near the town of Cariñena in Aragon. It was known in the Pyrenées Orientales region of France in the twelfth century, moving across Aude and into Mediterranean France. Although listed in Busbys 1832 collection and also by Macarthur, the identification may be mistaken and there are no records of commercial plantings in Australia. The Carignane of South Australia is now known to be Bonvedro, a variety originally from Portugal. The vine is vigorous, of upright growth and yields well. The leaves are large, thick and 5-lobed, with an intense green smooth upper surface and a slightly downy dull pale green under surface. The bunches are of medium size, long and compact, sometimes winged and made up of unevenly ripened berries. The berries are blue-black, oval in shape, quite thick-skinned, firm and juicy, maturing late and very prone to fungal diseases. The wine has hardness and astringency with little varietal character when young and therefore is not usually presented in France as a single varietal wine and only rarely so in California. However it does add greatly in finesse, length, fruitiness, body and colour to the juice of other varieties and is usually blended with varieties such as Grenache, Morrastel, Cinsaut, Mourvèdre, Shiraz and/or Aramon. With age Carignan loses its astringency and hardness, developing a rounder, softer palate. Formerly sometimes known as Pinot Chardonnay in Australia. In France there have been many apparent synonyms leading to confusion about the true variety. The most exact seem to be Chardenet, Chardenai, Chardenay, Chaudenay and Chardennet, but it was occasionally misnamed Pineau Blanc. This grape variety seems to have originated in the Burgundy area of Eastern France, although it was also found in early vineyards in the Champagne area of North-Eastern France. The variety was first imported into Australia in the collection of James Busby in 1832, but it was only after its reintroduction into Australia in the 1950s that there was general acceptance of the variety, first of the wine produced in the warmer climatic regions and then of that coming from cool climate regions. Chardonnay is the dominant white grape of the great still wines of Burgundy especially those of the Côte dOr, and is of major importance in the production of Champagne, the sparkling white wine of North-Eastern France. It is also grown successfully in several other countries including U.S.A.,  especially California and Oregon,- South America and Australia. In Australia the most significant plantings are in South Australia, New South Wales  especially the Hunter Valley - and Victoria. The vine produces quite vigorous growth with medium-sized, smooth, light green leaves which are not strongly lobed and it is early budding. The bunches are small to medium sized, winged, cylindrical and usually compact. The berry varies in size and shape, but is generally medium sized, round with a thin skin, amber-coloured when exposed to the sun, but green in the shade. In Australia Chardonnay has proved to be highly adaptable, growing well in warm irrigated regions or in cooler, often higher regions with a higher rainfall. The bouquet and palate therefore vary according to the growing conditions and the winemaking techniques used. Wine from the warmer irrigated regions, usually wood-treated, has a fruity bouquet of peaches and melon and a rich soft palate developing with age, whilst the wine from cooler regions will generally be more acidic, fresh and more delicate in its fruit palate. New plantings have increased significantly in these colder areas as the fresher style has become more popular. The Chardonnay from the latter regions is more often used in the production of sparkling white wines, the best of which are made utilising the traditional French Méthode Champenoise techniques. In France, Chardonnay is represented in the still, dry white wines of Burgundy, which are often golden in colour, with a rich, fruity and long palate. The sparkling wine from Champagne will usually present with a light colour, high acidity and a toasty, apple fruit-flavoured long palate. This style of wine is produced by the technique known as Méthode Champenoise and may vary in style from dry to semi-sweet and sweet with a small, fine, long-lasting bead. However many Champagnes are the result of blending Chardonnay with Pinot Noir and Pinot Meunier and only those known as Blanc de Blancs are made only from Chardonnay. In Australia Chardonnay is often blended with other varieties. Among the still white wines a Sémillon-Chardonnay blend has become popular. As in France and elsewhere, Chardonnay is widely used with Pinot Noir and other varieties in the production of sparkling white wines. While Chardonnay has been made traditionally in Australia with wood maturation, there is an increasing demand for unwooded Chardonnay as consumers have reacted to an overuse of oak. In France also known as Chasselas Blanc, Chasselas Doré, Mornen, Gutedel in Alsace and Fendant in Switzerland. There are however many sub-varieties in many different regions with regional names and with individual characteristics. 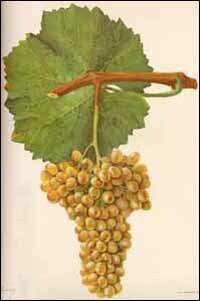 Chasselas may be the oldest known cultivated variety and its origins are not clear. It probably originated in Asia Minor, possibly near Constantinople. The Phoenicians may have been responsible for its distribution along the Mediterranean through Spain, up the Rhône Valley and to Italy, however the variety may have reached France in the time of François 1 or it may have originated near Chasselas near Mâcon in Burgundy, in the Midi or in the Cahors region. Certainly the Swiss obtained their Chasselas from the famous vines at Fontainebleau in Northern France. 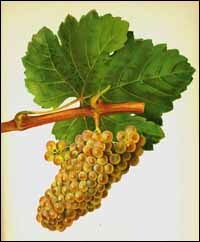 Chasselas was brought into Australia in the James Busby collection of 1832, but it has not become popular and although still grown in Australia it is used as a table grape as much as in the production of wine. Chasselas is distributed throughout France because of its great popularity as a table grape, the wine production coming from the more temperate regions. It is particularly successful in Switzerland in the Valais region and is also to be found in Central Europe, in Germany, Austria and Italy, in New Zealand and Australia. In Australia the most significant plantings are in Victoria, with the remainder in Western Australia and New South Wales. The vine is quite vigorous and fertile. The leaves are medium to large, 5-lobed ,, a little rough with a smooth upper surface of shiny green and a paler cottony under surface. The bunches are of medium size, cylindrical, long, winged and early-ripening. The berries are medium in size, even, round, loose, amber in colour when ripe, transparent and thin-skinned, and very sweet and juicy with crisp flesh. 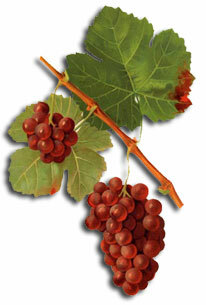 Chasselas usually produces a dry, delicate, undistinguished light white wine, though it is used to produce vin de paille, a golden, liqueur-like wine in Alsace and in Switzerland produces a popular dry, soft white wine with a more distinctive character and which is sometimes made into a sparkling wine. The Cellarmaster Collection of Rare Wine Books in the State Library of South Australia contains items dating from 1791 describing and illustrating the Fêtes des Vignerons, a very important wine festival which takes place in Vevey in Switzerland where Chasselas is the principal variety cultivated. None in Australia. In France the variety is also known as Pineau de la Loire, Blanc dAnjou, Plant dAnjou, Gros Pinot Blanc de la Loire and Gros Chenin. In South Africa the variety is known as Steen. Chenin Blanc originated in Anjou, south of the Loire Valley in North-Western France and was recognised there as early as the ninth century. It was then introduced to the Loire Valley and later into the Rhône Valley of Eastern France. 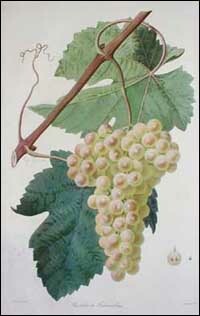 In Australia Chenin Blanc seems to have been introduced in the early days of settlement, possibly in the Busby collection of 1832, but it has often been wrongly named. It is recorded however that C. Waterhouse was growing Steen at Highercombe in South Australia in 1862 and producing wine. Chenin Blanc is still to be found in France in the region of Anjou, Touraine and the Loire Valley. It is now also grown in the U.S.A. especially in California, in South Africa, Chile, Argentina, New Zealand and Australia. In Australia the most significant plantings are in South Australia, but the variety has been successfully introduced into Western Australia. The vine has vigorous growth in good growing conditions. It is semi-upright in habit producing late-ripening fruit. The 3-5 lobed leaves have a rough, dark green upper surface and a downy under surface. The bunches are medium and compact, conical in shape and winged. The berries are of average size, oval in shape, thin-skinned and yellow-green in colour, developing red spots and producing a sweet juice. The wine produced from Chenin Blanc grapes will vary in style according to the soil, climatic and seasonal variations and the winemakers treatment. In cool areas the juice is high in acid and alcohol with a full-bodied fruity varietal palate, often leaving residual sugar, which will usually improve with age, developing honey and floral characteristics. When the wine is treated as a dry white wine it will still display fruit characters with an intense palate-as in the white wines of Anjou. When the berries are left on the vines to develop botrytis cinerea, an intense , sweet, viscous dessert wine is produced which will improve considerably with age. In the Touraine area of France, the style of wine produced will depend on the season and may range from a comparatively dry fragrant still wine through to the viscous sweet dessert wine. The sparkling wine of Vouvray is particularly popular and can be made successfully even in unfavourable seasons. In Australia Chenin Blanc is usually presented as a crisp dry white wine with high acid and an intense fruit palate often reflecting some wood treatment, but it is also often blended with other white grape varieties especially Sémillon. None in Australia. In Italy Dolcetto is also known as Dolsin, Dolsin Nero and its seven DOCs all in Piedmont are distinguished by a district name as in Dolcetto dAlba, Dolcetto di Diano dAlba, dAstilba, dAsti etc. Dolcetto has been cultivated in Piedmont since the eleventh century, though it is said that it may have originated in France. It is otherwise to be found in small plantings in Argentina and Australia. It was first planted in Australia in Victoria and South Australia in the 1880s, but it disappeared in the 1890s except for a small area in the Great Western district of Victoria, where the variety was introduced in 1867. Dolcetto is largely to be found in North-Western Italy in Piedmont, where the most suitable growing conditions for this variety exist. Its varietal limitations and demands restrict its distribution more widely, but plantings are also to be found in Argentina and Australia. The vine is not a strong grower, is prone to fungus diseases and produces well only on sites where the environmental conditions are most suited to its needs. The leaves are small, 3-5 lobed and have tufted hairs on the lower surface. The bunches are small to medium in size, winged and loosely formed. The berries, which are the first to ripen in Piedmont, are small, round and acquire a heavy bloom. Dolcetto juice possesses a high sugar and acid content, with medium alcohol and low tannin levels. The wine has a clear, brightly coloured red appearance, and a fruity, floral, smooth palate often with traces of almonds. As it matures quickly, it is therefore drunk young. None in Australia. The variety is also known as Plant Durif, Plant Fourchu, Pinot de Romans and Pinot de lHermitage (although not related to Pinot) in France. In California where it is grown with and not always distinguished from Peloursin, it is known as Petite Sirah. Durif was developed by a Dr Durif in South-East France about 1880 and possibly grown from a seed of the variety Peloursin with which it is often grown and from which it is not always distinguished nor separated. Durif was found originally in Isère, Ardèche and Savoie, but the plantings have decreased greatly in recent times. However it is now widely planted in California where it is usually associated with Peloursin. In Australia, the largest plantings are to be found in North-Eastern Victoria. The vine is vigorous and spreading in growth. The leaves are medium to large in size, usually 5-lobed, with a mat bright green upper surface and a paler green almost mat lower surface. The bunches are medium to large in size, cylindrical, fairly compact and slightly winged. The berries are black, small to medium in size, almost oval although the shape may be affected by the tightness of the bunch, firm, quite thick-skinned and produce sweet juice. The wine is deeply coloured, with a high level of tannin and a spicy, plum fruit palate. In California it may be used as a blending wine. In Australia it is also used to produce sparkling red wines. None in Australia, but the variety is known as Tokay in France, as Tokayu in Hungary and as Tokayer or Edler Weisser in Austria and Germany. The fortified wine known as Tokay originating in North-Eastern Victoria in Australia is however made from Muscadelle grapes. In Yugoslavia Furmint is also known as Sipon, Mislovai and Bijeli. Furmint probably has its origins in Hungary, though it may have been brought into Hungary in the early thirteenth century. It then made its way into the Hérault, Gard and Languedoc regions of France in the early nineteenth century. 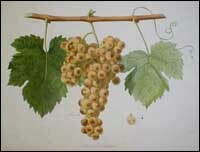 Furmint was introduced into Australia in Busbys 1832 collection, but was not widely grown though plantings were recorded at Great Western in Victoria in 1868. Furmint is grown principally in Austria, Hungary, Czechoslavakia and Yugoslavia and other countries in Central Europe and Eastern U.S.S.R. It is not widely grown in Australia. The vine is upright in growth, but neither very vigorous nor very fertile. The leaves are almost round, with a bright green upper surface but a matt very light-coloured downy under surface. The bunches are of medium size, cylindrical in shape and sometimes winged. The berries are round, uneven in size with semi-transparent skins, soft and golden in colour on maturity and usually picked late, though ripening early and susceptible to rot. The juice is high in acid and alcohol content and may be bitter-sweet but it produces a strong varietal wine in Hungary and Eastern Europe. It is better known however when used in the production of fine sweet dessert wines like those from Languedoc in South-Western France as in the Tokay Princesse or in the Tokay wines from Hungary, where the Tokay is blended with Harslevelu and the bouquet and palate develop with age. None in Australia. 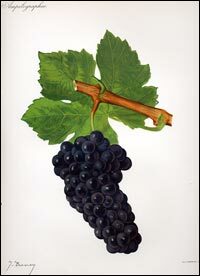 In France it is also known as Gamai Nicolas, Gamay Noir à Jus Blanc, Petit Gamai, Gamai Rond, Bourguignon Noir, Petit Bourguignon. The vines introduced by the Emperor Probis in 280AD to the Lyon region of Eastern France and which probably originated in Dalmatia seem to be the origin of the modern Gamay Noir à Jus Blanc, though it is also possible that it originated further to the north of Lyon in Burgundy. 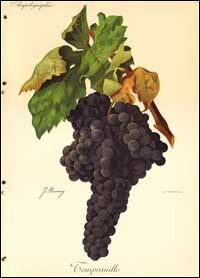 Many of the subvarieties were high-yielding but produced poor quality wine and therefore the cultivation of Gamay was forbidden in Burgundy in 1395. Nevertheless the variety survived and spread gradually to Franche Comte, Touraine, the Loire and the Ardèche. The history of the introduction of Gamay into Australia is not clear. Although a Gamay Noir from the Haute Saône is mentioned as Nr.186 in James Busbys 1832 collection, it seems that the true Gamay clones now in Australia are of comparatively recent introduction. Once one of the most widely cultivated grape varieties in France the plantings are now to be found mostly in Beaujolais, Burgundy and the Loire Valley. The variety is also to be found in Italy, especially in Tuscany since 1825, and in adjoining areas of Yugoslavia, Switzerland, Austria and Roumania, in Chile and Argentina. In Australia Gamay is grown on the Mornington Peninsula and near Beechworth in Victoria. The vine is moderately vigorous and a prolific bearer. The leaves are usually entire but may be 3-lobed, small to medium in size, pale green, smooth and shiny with a yellow-green hairless lower surface. The bunches are of medium size, compact, conical in shape and sometimes winged.The berries are black, covered with bloom, medium sized, oval with firm skin but soft, white, sweet flesh and ripen early. Gamay produces a high acid, low tannin, medium weight, light coloured red wine with a distinctive fresh fruity nose ready for immediate drinking. The wine usually appears under the regional name of Beaujolais (Eastern France), where Gamay is the dominant variety grown. Much of the juice is processed quickly from whole rather than crushed grapes to produce an often chaptalized and short-lived wine, but high quality wine can be produced when traditional techniques and fruit from the vineyards most suited to its cultivation, as in Haut Beaujolais, are used. The Loire Valley (Western France) also produces Gamay and the variety is often used in Rosé wines such as those from Anjou, but it is processed similarly in other regions. None in Australia. In Spain known as Granacha, Garnacha and Garnache, as Alicante or Granaccia in Sicily and France and as Cannonau in Sardinia. Grenache originated in Spain, probably in Aragon, and plantings spread through Roussillon, Southern Mediterranean France and eastwards into the Mediterranean regions of Southern Europe. The variety was introduced into Australia by James Busby in his 1832 collection, having been personally collected from Perpignan in Roussillon. In South Australia it was introduced by Dr Christopher Rawson Penfold who arrived in the state in 1844 bringing with him Grenache cuttings from the South of France. Grenache is grown throughout Mediterranean Southern Europe from Spain to Sicily, with plantings increasing in Southern France. The variety is also grown in South Africa, the U.S.A.  especially in the Central Valley of California- and in Australia  especially South Australia. The plantings in South Australia are particularly important in McLaren Vale, the Barossa Valley and Clare. The vine is vigorous and upright in its growth with good wind tolerance and is suited best to warm, dry and stony growing conditions. The 3-lobed somewhat closed leaves are shiny, yellowy-green in colour with clear veins and with a paler undersurface devoid of hair. The bunches are winged, irregular, of medium size and cone-shaped. The berries are rounded, blue-black and covered in bloom, thick-skinned and juicy. The juice is sweet, varying in colour and richness, according to the climatic conditions and viticultural practices, as quality is dependent on controlled productivity. It is generally spicy, berry-flavoured and soft on the palate with a relatively high alcohol content, but may be lacking in acid, tannin and colour. 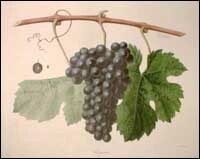 Grenache is usually used to make one of three styles of wine. It is used alone in the famous Rosé wines from the Tavel district of the Côtes du Rhône in South-Eastern France and in some regional dry red wines. However a second style emerges when other red grape juice is added to the Grenache as with Mourvèdre (Mataro) and Cinsault in the wines from the Côtes du Rhône in South-Eastern France or indeed with a selection from thirteen recognised varieties as in the wines from the nearby Châteauneuf -du -Pape. Grenache is also used alone in the Banyuls region of Roussillon in Southern France to produce fortified sweet wines known as vins doux naturels. In Australia, the consumer has developed an interest in dry red varietal wines made from Grenache, often produced from old vines which when grown in optimum conditions produce a rich, deeply coloured, aromatic, berry-fruit flavoured and full-bodied wine with a high alcoholic content. It is also blended successfully with the other varieties customarily used in the wines from the Côtes du Rhône region of South-Eastern France such as Mourvèdre (Mataro) and Shiraz. Grenache is also used to produce a fortified wine of a Port style. None in Australia. In France, although usually known as Côt, it may also be known as Noir de Pressac, Gourdoux, Estrangey, Côte-Rouge, Pied de Perdrix, Malbec (Gironde) or Auxerrois (Cahors, also in South-Western France). Malbec seems to have its origins in South-Western France near Cahors and was known to be in the Gironde region in the 1780s and then in Touraine. In Australia, although recorded in James Busbys 1832 collection, it was possibly misnamed and Macarthur writes of it in 1844 as having been sent out by Barton and Guestier from Bordeaux and likely to be well-suited to Australian conditions. Malbec is still to be found in the Cahors district of the Gironde region of South-Western France and in Touraine (Loire), although in diminishing quantities. It is also grown widely in Argentina and Chile, while there are also small plantings in the U.S.A. and Australia, mostly in South Australia. The vine is upright, vigorous, early-fruiting, a heavy bearer and disease-free in a good season, with broad 3-5-lobed dark green leaves often yellowish on the edges, with a smooth upper surface and a whiter, hairy under surface. The bunches are large, winged, loose, long in shape and plentiful. The berries are blue-black in colour, round, medium-sized, thin-skinned, producing a very sweet, clear and generally full-flavoured juice. The depth of colour and palate and the levels of acid and alcohol in wine produced from Malbec are greatly dependent on the variations in growing and climatic conditions in the different regions of production. Generally Malbec provides a light style wine of good colour, sweet, not very aromatic but with berries and spice on the palate, maturing quickly and at its best when drunk young. The juice is however usually blended with that of other grape varieties. To the wine of Cahors, the high level of alcohol, acid, tannin and colour give body, richness and colour to the wine. It is also used in the wines of St Emilion and Graves in the Gironde area, where it is softer with less acid, and adds delicacy. In Chile too it is used with the traditional Bordeaux varieties of Merlot, Cabernet Franc and Petit Verdot. In Australia it produces a wine with good tannin and colour but is mostly used for blending especially with Cabernet. None in Australia. In France Marsanne is also known as Marsanne Blanche, Grosse Roussette or Avilleran and in Switzerland as Ermitage or Ermitage Blanc. Marsanne is recorded from earliest times as present in the Marsanne region of Montélimar and on the slopes of Hermitage in South-Eastern France. Marsanne was introduced into Australia in the Busby collection of 1832 and is known to have been grown in Victoria since the 1860s. The vines at Tahbilk may be the oldest Marsanne vines in the world still in production. Marsanne is grown in the Northern Rhône area of South-Eastern France. It is also grown in the Valais in Switzerland and there are small plantings in Australia with areas in New South Wales and in Victoria, with the wines from Nagambie in Central Victoria being of particular interest. The vine is vigorous, high-yielding and well-suited to warm, dry and stony growing conditions. The leaves are large, round, rough, usually 3-5 lobed with a matt dark green upper surface and a lighter coloured tufted lower surface. The bunches are conical, winged, medium-sized and loose. The berries are small, round, fairly thin-skinned and become a deep golden colour on ripening. The flesh is soft, juicy and sweet. The juice is distinguished by its high alcohol level and deep colour and may be aged in oak. In France a light, dry, short-living varietal wine is produced and while its counterpart in Australia possesses more body and character, it also does not usually age well, though different wine-making techniques are now leading to longer-living wines. However Marsanne juice in the Rhône region of France was and may be added to Shiraz to add finesse and is the major variety used in the production of the famous white Crozes-Hermitage and the sparkling and still white wines of St. Péray. The addition of juice from the Roussanne grape variety to Marsanne results in a more aromatic, delicate and interesting wine, and these two varieties are of great importance in the production of the white wines of the Rhône. None in Australia. In France sometimes known as Vitraille. Merlot seems to have originated in the Bordeaux region of South West France, although it was only recognised in the eighteenth century. The variety has become increasingly important with plantings spreading across Southern France. In Australia Merlot was introduced in the 1960s by the C.S.I.R.O. as it sought to trial a wider range of grape varieties. Merlot is a major grape variety of the Bordeaux area of South West France and has now been introduced into grape growing regions across Southern France. It is also to be found in U.S.A.  especially California - Chile, Italy and Australia and plantings are increasing generally. In Australia, South Australia has led the way in producing outstanding wines from this variety. The vine is vigorous and quick growing, with thick, dark green leaves usually 5-lobed, with a rough upper surface and a hairy under surface. The bunches are quite large, cylindrical, sometimes winged and loosely made up of early and unevenly-ripening berries, which are blue-black in colour and crisp, sweet and juicy. The bouquet is aromatic and the berry-plum qualities are reflected in the palate. The wine is usually medium red in colour, medium bodied, soft and round and generally made for early drinking rather than slow maturation. Although in Australia Merlot is now achieving considerable recognition as a varietal wine, it is more widely known for its contribution to the palate when blended with other red grapes. The combination of Merlot with Cabernet Sauvignon, where the softness of the Merlot counterbalances the tannin and sometimes hardness of the Cabernet while the Cabernet adds length of palate, is highly effective and probably the most popular. This combination may also be varied with the use of Cabernet Franc or Malbec as found in the great red wines of Bordeaux, all used in varying proportions according to the individual regional and local characteristics and vintage conditions. In Australia also known as Mataro, as Balzac in the Corowa region of New South Wales and as Esparte in the Great Western district of Victoria. In Spain the variety is known as Murviedro, Mataro, Monastrell, Morastell, lEspar or Tinto. In France it is also known as Mataro, Carignane in Hérault, Balzac in the Cognac region and as lEspar in Languedoc. Mourvèdre has its origins in Spain where it was already recognised in the sixteenth century, identified as Murviedro in the old kingdom of Valence and as Mataro in Catalonia. The variety then spread across Roussillon and eastwards across Southern France. Widely grown, the plantings were greatly reduced after the outbreak of phylloxera in France in the 1860s and are only recently becoming more widespread again. 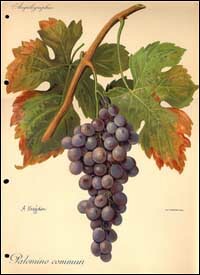 The variety was brought into Australia in the Busby collection of 1832 from Perpignan (Roussillon) and although not highly rated by Macarthur, it managed to survive. Mourvèdre is widely planted in Spain and is found throughout Mediterranean France to the Bouches du Rhône. It is also grown in the U.S.A.- especially in California - and in Australia. In Australia the most significant plantings are in South Australia and in New South Wales. The vine is upright and of vigorous growth with medium-sized 3-5 lobed leaves, dark green in colour with a downy under surface. The bunches are medium-sized, long, conical and winged. The berries are round, medium-sized, blue-black in colour covered with bloom, with thick skins and a somewhat bitter juice. The wine possesses good colour, is rich and though it may be comparatively neutral on the palate, it is more usually quite astringent when young, high in acid and alcohol, but perfumed and it will soften with age. Its astringency has led to its use as an important blending wine rather than as a varietal wine, and it is used as one of the thirteen varieties accepted in the production of the famous Châteauneuf-du -Pape from the Rhône Valley of Southern France. In Australia Mourvèdre is used either as a varietal wine or is blended with other varieties commonly used in the wines from the Rhône Valley of France such as Grenache, Shiraz etc. 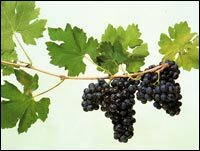 Mourvèdre is occasionally used to produce a vin de liqueur as in South-Western France or in a port style wine in Australia. In Australia also known as Muscat à petits grains, Brown Muscat or Frontignac. This variety has many different names all over the world. In France it is also known as Muscat Blanc (de Frontignan), Muscat à petits grains or Muscatel, in Portugal as Muscatel Branco, do Douro etc., in Spain as Moscatel Menudo Branco, Bruno etc., in Italy as Moscato Bianco, dAsti etc. and can be recognised in Muskat, Muskatel, Muskateller etc. in Germany and Austria. As the oldest grape variety known, probably originating in Ancient Greece and then carried through Italy into Roman France, it is recorded as being exported from the port of Frontignan in South-West France during the reign of Charlemagne. Muscat de Frontignan was introduced into Australia in the Busby Collection of 1832 and endorsed by Macarthur in 1844 as a suitable variety for Australian conditions. 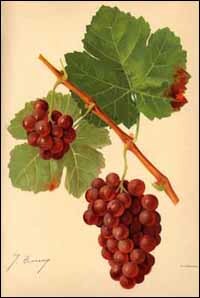 Muscat de Frontignan is widely distributed but not always grown in large quantities, and while there is a stable white variety there are other sub-species which produce grapes of the three colours red, rosé and white on the same vine irregularly. It appears that the stable white variety is more common in Europe and the irregularly coloured sub-species more common in Australia and South Africa. Muscat de Frontignan is present in Mediterranean France, in Hérault, the Pyrenées Orientales and Bas Languedoc, though plantings decreased greatly after the outbreak of phylloxera. The variety is also present in Italy, Spain, Hungary, Samos (Greece), the U.S.A. especially California, Argentina, South Africa and Australia. In Australia approximately half is grown in South Australia and other plantings are to be found in New South Wales and the Rutherglen area of North-East Victoria where it is known as Brown Muscat. The vine is vigorous, semi-erect, spreading and low-yielding. The leaves are of medium size, 3-5 lobed, thin, smooth, with a dark green upper surface and a paler, hairless under surface. The bunches are of medium size, elongated, cylindrical, compact and sometimes winged. The berries are medium-sized, usually round, transparent but becoming opaque on maturity and golden yellow in colour with reddish spots. They ripen early and dry out readily but are very often left to develop a high sugar concentration. The flesh is firm and very sweet with the juice distinguished by a distinct flavour of musk. The wine produced from Muscat de Frontignan grapes is often blended with other varieties and will vary in style from a sparkling white wine with a fruity musky palate as in the Clairette de Die of South-Eastern France through a dry still white wine as is the Frontignac of the Barossa Valley of South Australia, a vin doux naturel such as that of Rivesaltes in South -- Western France, a vin de liqueur and then to the full-flavoured, rich, fortified dessert wines which are long lasting, maturing and developing very slowly to become wines of very great quality as in the Muscat de Beaumes de Venise of South-Eastern France and the Brown Muscat from Rutherglen in Victoria. None in Australia. In Italy Nebbiolo is also known as Spanna, Spana, Picotenet, Pugnet (in Aosta) and Chiavennasca (in Lombardy). There are also several sub-varieties. The first historical reference to Nebbiolo was made in the thirteenth century placing it in the Alba district near Turin, though it is thought that the variety was known to the Romans. Now it is recognised for its contribution to the quality wines of Barolo a and Barbaresco. Nebbiolo was introduced into Australia from the University of California, Davis, for the vine breeding programme of CSIRO at Merbein, but the small commercial plantings presently in Australia came from the later UCD cuttings sent to Merbein in 1974 or from cuttings sent from the University of Turin in 1989. The largest plantings of Nebbiolo are to be found in Piedmont in North-Eastern Italy. The naming of the grape seems to have been influenced by the fog usually present during the vintage season. It is here that Nebbiolo produces its best in terms of quality as the environment provides perfect growing conditions for the special requirements of this demanding variety. It is also to be found in small quantities in Argentina, California, Switzerland, Uruguay and Australia, where small plantings are being trialled in especially selected areas of the King Valley region of Victoria, the Margaret River region of Western Australia and the McLaren Vale region of South Australia. There are several sub-varieties but the vine is generally vigorous and bears well, although the climatic and soil conditions are of particular importance for the quality of wine produced, and the juice requires careful handling. The leaves are 5-lobed and dark green with an irregular upper surface. The lower surface is very hairy. The bunches are of medium size, compact, conical in shape and winged. The berries are of medium size, round in shape, covered in bloom, tough skinned and ripen late in the season. The juice from the Nebbiolo grape is high in acid, alcohol and tannin content. It benefits from long barrel maturation to develop as a rich, dry red wine with a fruity berry and floral nose and a complex full palate which will continue to improve with age. Nebbiolo is used in the production of sparkling or still dry or sweet red table wines. In Australia the variety is also known as Paulo. 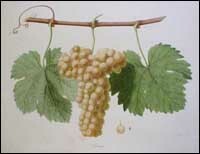 This white grape is the Listan (dAndalousie) from Spain and should not be confused with the red grape recorded much earlier in historical records as Palomino Commun. 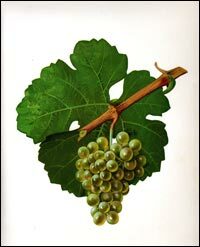 In France and Spain Palomino is commonly known as Listan, in Spain also as Alban, Temprana or Tempranilla, in Portugal as Perrum, in South Africa as White French and in California wrongly named as Golden Chasselas. Palomino originated in Andalouscia where it is the major component in the production of sherry. 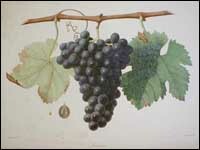 It is listed in Busbys 1832 collection as one of the grape varieties he collected from Malaga under the name of Temprana. Spain is the major producer of Palomino grapes particularly in the region of Jerez, but the variety is also to be found in Southern Portugal, the Midi area of Southern France, in South Africa, California and Australia, where it is used mainly in the production of sherry. Edward Peake was the first to introduce the variety into South Australia, when he imported Palomino cuttings directly from Spain for his vineyard at Clarendon in 1849. The vine has spreading growth, is semi-erect, fairly vigorous and is generally high-yielding. The leaves are medium to large in size, deeply indented and 5-lobed. They have a rough dark green upper surface and a very hairy lower surface. The bunches are large, conical, winged and loose. The berries are of medium size, round, firm, tough-skinned, early ripening and become golden and darker in colour as they ripen with a light bloom. The juice is low in acid content with a comparatively neutral aroma. Palomino is used most often in the production of fortified wines, particularly sherry, in Spain, South Africa and Australia, though it is also used to produce a dry, fresh, pleasant white table wine in Southern Spain and South Australia. None in Australia. Whilst the name Pedro Ximénez is widespread in Spain, it is also known as Ximénès and Pedro Ximen, and as Jiménez and Pedro Jimènez in Andalusia and as Pedro Giménez in Argentina..
Pedro Ximénez is thought to be of Spanish origin and is still widely grown in Southern Spain. 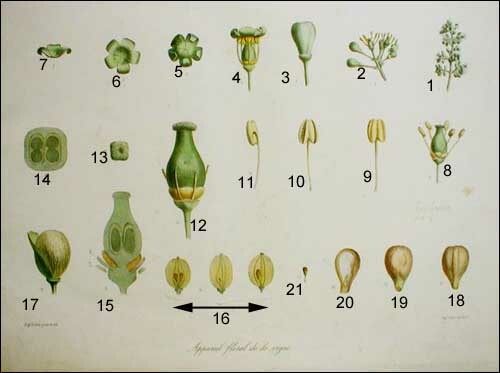 James Busby brought specimens back from Xeres de la Frontera in his 1832 collection, but MacarthurArthur makes no mention of it in his notes on his experiments with those vines surviving from that collection which showed good adaption to Australian conditions. 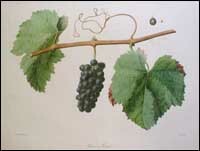 However Dr A.C. Kelly mentions the variety in his book The Vine in Australia (1861) as having been imported directly from Jerez into South Australia to be planted at Clarendon and also that some vines had come from the Sydney Botanic Gardens to the Adelaide Botanic Gardens in about1839. In Spain Pedro Ximénez is to be found nowadays mostly in Andalusia, Extramadura and Valencia. It has been considered to be the most important white variety of Argentina, though there is now some doubt about the authenticity of that variety. There are also small plantings in California, Chile and Australia. The vine is of upright and vigorous growth. The leaves are small to medium in size, bright green, with a smooth, flat upper surface, and a lower surface with hairs on the clearly defined veins. They are 5-lobed and slightly irregular in shape. The bunches are below average to average in size, cylindrical, winged and compact. Although the berries may vary in size they ripen at the same time. The berries are almost globular, thin-skinned, transparent and soft, producing a very sweet juice. Pedro Ximénez produces wine of good quality with a fine and pleasant though neutral palate. The variety is associated with the production of sherry and other dry and fortified wines in Spain, but it is used to make a dry white table wine in Southern Spain and is often blended with other white varieties in Spain and Australia. In Australia also known as Pinot Grigio. In France also known as Pinot Beurot, Gris Cordelier, Auvernat Gris, Malvoisie, Tokay dAlsace and Fromentot. In Germany known as Ruländer and in Italy as Pinot Grigio. Pinot Gris is a variant of Pinot Noir and usually grows with it. It is therefore considered to have originated in the Burgundy region of Eastern France and indeed Pinot varieties were mentioned in thirteenth-century French manuscripts. Pinot Gris was introduced into Australia in the James Busby collection of 1832 but has only recently been developed as a varietal wine. Pinot Gris is generally found wherever Pinot Noir is grown, especially in France where it is to be found in Burgundy, but nowadays it is better known in Alsace. There are plantings in Germany, Italy and in Central and South-East Europe, in U.S.A. where small plantings have been established in several states, and in Australia. 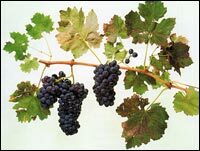 In Australia, although a variety bearing that name was introduced in 1832, it is only in the 1990s that the true variety has achieved recognition by growers and consumers, with the most important but small plantings located in Victoria, and Tasmania and South Australia..
As a mutation of Pinot Noir, the vine is delicate in its growth, low-yielding, late-developing with early-ripening fruit. The leaves are large, 5-lobed when noticeable, thick with a smooth green upper surface and a yellowy-green, downy under surface. The bunches are small, winged, cylindrical but often loosely shaped. The berry is small, less pigmented than that of the Pinot Noir, varying in colour from pink to grey, transparent and firm, producing a fine, sweet juice. The wine, yellow to golden in colour and usually with a low acid level, has a long, dry often perfumed fruity palate, though it may vary from a light early picked wine as in Italy to a full-bodied style-even late harvest in style as in Alsace-depending on the winemaking techniques used. In Australia the varietal label Pinot Gris will usually indicate a wine made in the full-bodied style of Alsace in France and Germany, whilst the label Pinot Grigio will usually indicate that the wine is made in the dry, lighter, Italian-influenced style. None in Australia, but also known as Pineau, Noirienr and Morillon in France and de Burgunder or Klevner in Germany. This grape variety probably originated in the Burgundy region of Eastern France and was later identified in the Champagne region of North Eastern France. In Australia Gregory Blaxland was thought to be making wine from Pinot Noir in the 1820s after arriving in Sydney with vine cuttings from the Cape in 1805. It is known that Pinot Noir was represented in the Busby Collection of 1832, but although plantings were maintained in the Hunter Valley region of New South Wales, it was only in the 1970s that interest grew in the variety and plantings were expanded. Pinot Noir is the dominant red grape variety of the Burgundy region of France, especially the region of Côte dOr. It is also of great importance in the Champagne region of North Eastern France where it is blended with Chardonnay to produce the famous sparkling wine of the region. There are also plantings in many other countries including the U.S.A.  especially California and Oregon - and in Australia. In Australia the most important plantings are currently in South Australia  especially Coonawarra and the Adelaide Hills -, in New South Wales in the Hunter Valley, and in Victoria in the Yarra Valley, on the Mornington Peninsula and in the Geelong region. There are many different clones grown, developed to suit the different climatic and soil conditions as the variety generally benefits from a cool climate rather than a hot, dry one. The vine itself is slow to mature, low yielding with early-ripening fruit. The leaves are pale green with a matt surface, medium-sized, often almost round, not deeply indented and have a hairy undersurface. The bunches are small, generally compact and made up of small, tightly packed, slightly oval, sweet, juicy grapes with a dark violet, bloom-covered skin. In Australia the colour, bouquet and palate vary considerably according to the clone and growing conditions. Whilst wine produced from warm region Pinot Noir may often lack depth of colour , varietal aroma and palate, the wine from cooler areas is of a darker colour, is a medium-bodied more complex wine with a cherry/strawberry aroma and palate which with age may develop characteristics more reminiscent of Burgundy with the fruit becoming more like plums and with a longer palate. When used for the production of sparkling white wine Pinot Noir may be blended with several white wine grape varieties or as in the superior quality wines resembling Champagne, with Chardonnay and Pinot Meunier. The best of these wines are made according to the traditional French Méthode Champenoise. The aroma and palate will range from the dry to the sweet and the best will possess a good bead, a fresh, fruity aroma and a delicate but complex and lasting palate. In France the Pinot Noir grape is recognised as the grape used in the great and world-renowned red wines of Burgundy, especially from the Côte dOr region, and for its use, especially when blended with the Chardonnay and Pinot Meunier grapes in the Champagne region, to produce the equally world-renowned sparkling white wine known as Champagne. The style known as Pink or Rosé Champagne has been developed from residual Pinot Noir skin colouration. In Australia this variety was also known as Rhine Riesling to avoid confusion with Clare Riesling (Crouchen) and Hunter River Riesling (Sémillon). Elsewhere it is also known as Riesling Blanc and Weisser Riesling. Riesling has its origins in the Rheingau region of Germany. In Australia James Busby listed Rischling in his 1832 collection and it is known that William Macarthur imported some Riesling vines from the Bas-Rhin in 1838. In 1847 Johann Gramp imported some Riesling grapes into the Barossa Valley of South Australia, producing his first vintage in 1850. Riesling is the dominant grape variety of Germany and plantings stretch through the vine-growing areas of Central Europe. In terms of region, the plantings in the Alsace region of North-Eastern France, in California in the U.S.A. and in Australia are also important. In Australia the most significant plantings are in South Australia, with wine from the Clare, Eden Valley and Barossa Valley regions being of particularly high quality and interest. More recent plantings of Riesling in the Margaret River region of Western Australia and in Tasmania are also now producing excellent wines. The vine, of semi-upright and vigorous growth in cool climates, has small, thick, dark green leaves, usually 5-lobed, with a paler undersurface. The bunches are usually small, tight, winged and cylindrical in shape. The berries are usually small, round, thick-skinned and pale yellow becoming darker and speckled when ripe. The wine will vary in style according to the regional and climatic variations. It may be dry, with high acid and slightly sweet through to very sweet if the fruit has been affected by botrytis and/or frost. The nose is aromatic and delicate when produced from grapes grown in a cool climate with lime and citrus fruit and sometimes slightly spicy. The colour will vary from a very pale yellow with a slightly green and often brilliant tinge when young and from a cool region developing with age into a golden, honey-coloured sometimes viscous wine. The palate will vary from the crisp, acid flavour of the young wine to the rich, honey, spicy, toasty palate of the developed wine. Thus the fresh, acid, dry wines from Alsace contrast strongly with the much sweeter, lighter, often highly aromatic wines of Germany culminating in the botrytis and/or frost affected Trockenbeerenauslese and Eiswein styles of the Rheingau. The wine produced from botrytis and/or frost- affected grapes is usually very sweet, golden with a lime and tropical fruit palate with some viscosity. In Australia, Riesling is now regaining its popularity after a decline in demand. Although sweet dessert style wines are made, the crisp, acidic usually dry but fruity Rieslings from South Australia are outstanding. Riesling is also now being blended with other white varieties especially Gewürztraminer. None in Australia, but also known in Franceas (Petite) Rousette in Eastern France, in Ardèche and Ain, as Bergeron in Savoie, Plant de Seyssel in Ain and as Fromenteau in Isère. Roussanne seems to have originated in the area where it is mainly grown in the Côtes du Rhône and the valley of the Isère in Eastern France. In Australia Roussanne is named by James Busby as part of his 1832 collection, but it is not mentioned by Macarthur in his comments on the suitability of various grape varieties for Australian conditions. However Roussanne was reintroduced into Australia by the CSIRO in 1982. Plantings of Roussanne are to be found in regions with a Mediterranean climate such as those of the Upper Rhône Valley of Eastern France and the Var, and in the Tuscany region of Italy near Lucca. In Australia the significant plantings are in the Yarra Valley of Victoria. The vine is vigorous and semi-erect but may be fragile. The leaves are medium to large in size, quite thick, 3-5 lobed and rough with a dark green upper surface and a downy lower surface. The bunches are of medium size, elongated, semi-cylindrical and clearly winged. The berries are small, round, sometimes irregular, very golden and develop rust coloured spots on maturity. The skin is firm with crisp flesh and very sweet juice. Roussanne is very rarely used to produce a varietal wine but more usually blended with Marsanne to produce the famous white wine of Hermitage from the Rhône Valley of Eastern France, adding elegance, delicacy and aroma to the Marsanne, the quality of the Roussanne improving with age. It is also used to produce the vin de paille of the same region, with the juice becoming thick and viscous, and in the sparkling wine of Saint Péray and it may be used in Châteauneuf -du -Pape. It is also used in the production of Montecarlo Bianco in Tuscany in Italy. In Australia Roussanne is usually used with Marsanne in the Yarra Valley of Victoria to produce a Rhône style wine. There are many subvarieties of Sangiovese, but these notes deal with Sangiovese Grosso, also known as San Gioveto in Tuscany and in other parts of Italy as Prugnolo, Brunello, Calabrese, Uvetta, Montepulciano etc. The variety seems to have originated in Tuscany and was already well known in the sixteenth century. Limited originally to Tuscany, by the nineteenth century Sangiovese Grosso had spread to Emilia- Romagna and then widely throughout Italy. It was introduced into Australia by the CSIRO in the late 1960s and developed commercially at Mudgee in New South Wales. Some Italian clones were introduced in the 1980s followed by further importations in 1990. Sangiovese is widely grown throughout Italy. There are also small plantings in USA, especially in California, in Argentina and in Australia. In Australia the most significant plantings are those in the Mudgee area of New South Wales, in McLaren Vale in South Australia and in the King Valley in Victoria. The vine is moderately vigorous, has a good resistance to disease and generally yields moderately to well. The leaves are dark green, regular, slightly elongated, usually 3-lobed with a shiny, smooth and flat upper surface and a light green, slightly hairy lower surface. The bunches are of medium size, conical, winged and loose. The berries are small to medium in size, oval, blue-black with thick, tough skins covered in bloom and juicy. The berries produce a light-coloured, slightly bitter juice of medium sweetness with a distinctive nose. The wine has a high acid level, with tannin, moderate alcohol and a dry, earthy, full-flavoured palate. The quality of the wine depends on the naturequality of the clone and there are therefore wide variations in standardquality, depth of colour, flavour and ageing potential.lasting qualities. This is the grape variety used in the famous wine of Brunello di Montalcino in Southern Tuscany, but the juice is usually blended with that of other varieties and is a major component of the top Chianti wines, usually making up 75% -90% of a blend with Canaiolo, Trebbiano etc. It is increasingly being blended with Cabernet in Italy to produce red wine of excellent quality. In Australia, where production is small, Sangiovese is usually used to produce varietal wines, but may be found blended with other varieties. In Australia this variety is usually known as Sauvignon Blanc. In France the variety may be called Petit Sauvignon or Sauvignon Jaune in the Gironde region of South West France and Sauvignon Fumé or Blanc Fumé in West and Central France. Sauvignon seems to have originated in the Gironde area of South West France and was widely recognised there in the seventeenth century. In Australia, the variety was introduced into the country in the Busby collection of 1832. In France Sauvignon is of particular importance in the Bordeaux region of South West France and in the Sancerre and Pouilly regions of the Loire Valley of Western France. There are also important plantings in the USA  especially California - New Zealand and Australia. In Australia the largest plantings are in South Australia, but the variety is also represented in Victoria, New South Wales and Western Australia. The vine is vigorous and upright in its growth. The leaves are small, broad with 3-5 lobes with a matt green upper surface and hairs on the underside. The bunches are small, short, tight and conical in shape. The berries are small, slightly oblong and transparent, with thick skins until just before maturity. In France, wine produced from the Sauvignon grape may be of the complex, rich, sweet dessert wine style of the Sauternes or Barsac regions, when the Sauvignon juice is added to the Semillon base with a small quantity of Muscadelle, and where it adds body, colour and bouquet to the wine. It is also used in the dry white wine of the adjacent Graves region, where the wine develops some depth and an enhanced bouquet with age. It is also used by itself in the famous wines of Sancerre and Pouilly-sur-Loire where it presents as an acid, dry, somewhat steely but fruity wine with the very particular vegetal, gooseberry flavours of the variety. In Australia, the palate of the wine depends on the climatic and soil characteristics and the winemaking style employed. When the fruit is from the cooler areas, the wine will have a high acid and vegetal fresh palate with a grassy, gooseberry nose. Fruit grown in the warmer areas will produce a more tropical, herbaceous nose with a broader, fruity, soft palate. The wine is often wooded introducing smokiness and complexity to the palate. Australian Sauvignon Blanc therefore usually produces a fruitier and dry wine, though there are some successful producers of sweet sticky dessert wines made from this variety. New Zealand is becoming well -known as a producer of a Sauvignon Blanc with very specific varietal characteristics when young. Sauvignon juice is frequently blended successfully with other white grape juice especially Semillon, both in France and Australia. In Australia also known as Hunter River Riesling. In France also known as Gros Semillon or Semillon Muscat. Semillon seems to have originated in the Bordeaux region of South West France, where it was certainly well recognised in the eighteenth century. In Australia the variety was probably brought out in the Busby collection of 1832. It is known that wine was being made from Semillon grapes in the Hunter Valley area of New South Wales in the early 1840s. Semillon is the major white grape of the Gironde region of South West France, often blended with other white varieties and featuring in the world-famous botrytised sweet wines of Sauternes and Barsac and the usually dry white wines of Graves. It is also grown in Chile, Argentina, the U.S.A. - especially California- and Australia. In Australia the most important plantings are to be found in the Hunter Valley and the Murrumbidgee Irrigation Area of New South Wales and in the Barossa Valley and Clare regions of South Australia. The vine is a vigorous grower with large, broad, thick 3-5-lobed dark green leaves, rough on the upper surface and hairy on the underside. The bunches are compact, winged, medium-sized and cylindrical in shape. The berries are usually round, thin-skinned, very juicy and sweet with a distinct varietal flavour. When overripe and allowed to become affected by botrytis cinerea (noble rot) the variety is the major component of the unique wines of Sauternes. The Semillon grape is distinctive in that it lends itself to the production of a variety of different wine styles. From the Bordeaux region of France come the great Sauternes and Barsac. These wines are produced from overripe Semillon grapes which have been affected by botrytis cinerea and are hand-picked as ready. When blended with smaller quantities of Sauvignon Blanc and Muscadelle the wine produced is viscous with a rich, fruity nose, a smooth, full-bodied, long lasting and fruity  often citrus-like  palate. When the grape is unaffected by the botrytis cinerea the juice is used to make dry white wood-fermented wines with a distinct palate such as the wine of Graves, also from the Bordeaux area. In Australia the wine produced from Semillon grapes presents different characteristics depending on the climatic and soil variations and the winemakers style. From the cool regions the wine will be high in acid, dry and often citrus-flavoured on the palate, whilst wine from the warmer regions will be less acid, with less citrus and more tropical fruit flavours. It may have been aged in the bottle or wood, adapting itself to either process. The Hunter Valley region of New South Wales is particularly well-known for its bottle-aged Semillon, with the wine developing a deep golden colour and flavours of honey and toast in a full-bodied, longlasting palate. In addition a sweet, full-flavoured and often viscous wine is produced especially when the fruit is affected by botrytis cinerea. In Australia Semillon is popular as a varietal wine, but is often also blended with Sauvignon Blanc or Chardonnay. In Australia also known as Hermitage, in France as Syrah or Petite Syrah. This grape variety seems to have originated in the Northern part of the Rhône Valley in France. It has been known there since the twelfth century. Shiraz arrived in Australia in the Busby Collection of 1832 and features as a variety recommended for Australian conditions in Sir William Macarthurs "Letters on the Culture of the Vine" published in 1844 and based on his own research and experience. Shiraz is the grape variety used in the famous wines of Hermitage, Crozes and the Côte Rôtie in the Rhône Valley of Eastern France and is also one of the varieties used in the wines of Châteauneuf-du-Pape. It is now also successfully grown elsewhere especially in Argentina and Australia. In Australia, Shiraz is widely grown but the most significant regions of production are to be found in South Australia, in Coonawarra, the Barossa Valley, McLaren Vale and the Clare Valley, in New South Wales especially in the Lower Hunter Valley, and in Victoria at Rutherglen and in the Central Highlands region. The vine has a vigorous, spreading growth producing large 5-lobed leaves with down on the paler green under surface and protuberant light-yellow veins. The bunches are long, cylindrical in shape and become loose in structure as the grapes ripen and shrivel. The berry is small to medium in size, oval in shape, dark black, comparatively thin-skinned, juicy and sweet. The bouquet is usually distinguished by aromas of black pepper, mulberries and blackcurrants sometimes accompanied by a hint of tar. These are usually present in the palate together with hints of tannin and wood  especially American oak in Australia  and will blend to present a balanced and rich palate with long maturation. The level of acidity present, the richness of palate and fruit quality on the palate will vary according to the climatic conditions of the region of provenance. As palate preferences change, so have many Australian winemakers chosen to produce a wine from Shiraz grapes that is now lighter in style and achieves a balance between the tannins, wood and fruit more quickly and have minimalised the tarry components. In Australia too it is common practice among the larger, commercial wineries to combine Shiraz juice from the same vintage but from different vineyards and indeed from different states and climatic regions in order to produce a balanced wine. Shiraz juice is often blended with Cabernet and also less well-known varieties e.g. Mourvèdre and Grenache in Australia. It is also used to produce a sparkling red wine, a style currently popular in Australia, and also excellent port-style fortified wines. Also known as Siylvaner. No other synonyms in Australia. Elsewhere the variety is known as Sylvaner vert or Gentil vert in France, as Grüner Sylvaner, Grünfraenkisch, Franken Riesling (in France, Alsace, Germany), and many others in Central Europe, differing in each region. Siyllvaner probably originated in Austria, though originally it wass thought to come from Transylvania. The vine was then taken into Germany where it is recorded in medieval times at Castell in Franken. In Australia there were experimental plantings in N.E. Victoria and Eden Valley in South Australia in the 1970s.
. Imported into Australia. Brown Bros of N.E. Victoria known to have experimented with it in the 1970s - anything else? Silvaner Sylvaner is still to be found throughout Central Europe, in Germany and Alsace, France, although plantings have decreased considerably. There are now small plantings in California and Australia. The vine is fairly upright, vigorous, productive and a reliable early ripener. The leaves are of medium size, 3-lobed, thick, round, with a light yellowish green upper surface and a green, hairless under surface. The bunches are small, short, cylindrical and tight. The berries are of medium size, round unless deformed by pressure, green with brown sunspots where exposed to the sun and with quite thick skins. The juice is quite thick, viscous with a high natural acidity, and very sweet and pleasant, but while possessing body, lacks a distinctive varietal palate. It is therefore usually blended with the juice of a drier variety e.g. Riesling or Elbling. It is however sometimes presented as a late harvest sweet wine. None in Australia. The variety is also known in Spain as Tinto Madrid, Tinto de la Riojga, Tintao Fino, Tinto del Pais and Tinto de Toro, in Portugal as Tintao Roriz or Aragonêz, in California as Valdepenas and in Italy as (probably) Negretto. Tempranillo seems to have originated in Northern Spain and was only introduced to other countries in the second half of the twentieth century. It was officially authorised in France in 1976, there were large plantings to be found in Argentina by 1986 and small plantings in Australia. Tempranillo is to be found in Northern and Central Spain especially in the Rioja Alta and Rioja Alavea, in Portugal in Aleutejo and Douro, where it is used predominantly in the production of port, and in France in the Midi/Aude region. It is widely grown in Argentina, represented in California as Valdepenas and there are experimental plantings in Australia. The vine is relatively vigorous, upright and drought-resistant with early-ripening fruit. The leaves are dark green, large, thick and 5-lobed with a smooth upper surface and a downy lower surface. The bunches are large, winged, cylindrical and comparatively long. The berries vary in size but are generally medium-sized, thick skinned, covered in bloom and juicy. Tempranillo provides a deeply coloured, dry, long-lasting wine with low levels of acid and alcohol. The palate does not have a marked varietal character and the juice is therefore often blended with Grenache,Garnacha, Mazuelo, Graciano and more recently Cabernet Sauvignon and Merlot. None in Australia, but also known as Tarret or Terrain in South-Eastern France. Terret Noir iTerret noir is a very old variety and probably originated in Hérault in South-Eastern France. The variety was introduced into Australia in the Busby collection of 1832 but is not widely grown. Terret Noir is grown principally in the Aude, Hérault, Gard and Vaucluse wine growing regions of South-Eastern France, with some plantings in the Minervois region of South-Westerern France. However it has decreased in popularity. In Australia small plantings are to be found in the Barossa Valley of South Australia. The vine is vigorous, upright in growth and usually yields well. The leaves are of medium size with 3-5 lobes, with a smooth medium green upper surface but with a whitish, tufted under surface. The generally medium-sized bunches are pyramid-shaped and usually compact and winged. The oval berries of medium size have a thick, firm skin and are transparent, juicy and reddish-black in colour. Terret Noir provides a light, fresh, coloured, acidic, astringent and strongly perfumed wine which blends well with other varieties. It is one of the varieties recognised officially for inclusion in the wines of Châteauneuf -du - Pape du-Pape and the Côtes du Rhône of South-Eastern France. In Australia the variety is also known as Gewürztraminer. In France it is known in Alsace as Gentil Blanc, Weiss Edler and Knipperlé or Kniperlé and it is known as Kleiner Rauschling in Haut and Bas Rhin and also as Weiss Klavner in Bas Rhin. The prefix Gewürz- is often added to Traminer to describe a clone producing a more aromatic, finer and more delicate juice. The variety is thought to have originated near Tramin in Northern Italy and been common in the Alto Adige region in medieval times, but is usually associated with the Baden region of Germany from where plantings spread through Southern Germany along the Rhine and Moselle rivers and into Alsace, where it was recorded in the late eighteenth century. The variety was introduced into Australia in the James Busby collection of 1832 but has been reintroduced for more recent plantings. Traminer is to be found in Central Europe, in Germany especially in the regions of Baden and the Rheinpfalz, in France especially in Alsace, in Italy, Austria, the United States especially California, New Zealand and Australia. In Australia the variety is not widely grown but the most significant plantings are probably in South Australia. 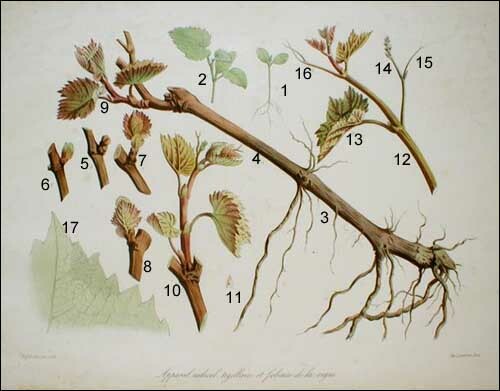 The vine is vigorous when young, with the size of the 3-5 lobed leaf depending on whether the vine is planted in a cool or a warm region.The leaves are rough with a lighter-coloured under surface which is downy and lightly-veined. The bunches are small, compactness and shape depending on climatic variations. The berries are small, oval with pink tones when mature with sun exposure, thick-skinned, crisp, very sweet and early ripening. The fruit yield is often low and may be erratic. The juice from Gewürztraminer grown in a cool climate produces a deeply-coloured wine with a bouquet which is perfumed, spicy, floral and yet fruity,with high acid and alcohol levels and a dry palate which suggests lychees and which should be drunk when young. In a warm climate, as in Australia, there may be problems with low acid content and a suggestion of oil on the palate. The Gewürztraminer wine from Alsace in Northern France is marked by its fruity, grapey but dry palate and in exceptional years an outstanding wine harvested late in the season with longliving qualities and a very high alcohol content is produced, known as Vendange Tardive and later and greater still Sélection de Grains Nobles. In Australia Traminer is often blended with Riesling to produce a popular Traminer-Riesling wine. In Australia also known as White Shiraz and White Hermitage. In France Ugni Blanc or Uni Blanc has many synonyms in many small regions and is known as Bouan or Beau near the Italian frontier, Cadillac in the Gironde, St Emilion in Cognac, Trebbiano in Corsica and as Thalia in Portugal. In Italy Trebbiano may be followed by Fiorentino, Toscano etc. to identify differing but basically similar sub-varieties. Ugni Blanc may have originated in the Levant and has been in Italy since Roman times. One major strain was certainly recognised in the thirteenth century near Bologna, but sub-varieties are to be found throughout Italy. It seems that Ugni Blanc was introduced into Southern France through the ports such as Marseilles and Bordeaux, or by the Papal retreat to Avignon in the fourteenth century. The variety was introduced into Australia by James Busby in 1832. Ugni Blanc is to be found throughout Italy in various sub-varietal forms. In France it is to be found along the Provençal coast, in the Gironde and Charente. The variety is also to be found in South Africa, the U.S.A.- especially in California - in Argentina and Australia. The major plantings in Australia are in New South Wales and South Australia. The vine is vigorous in growth, quite upright, late budding and is a very high-yielding variety. The leaves are light green with tinges of yellow, medium to large depending on the sub-variety, usually 5-lobed, thick and quite rough with light down on the under-surface. The bunches are very long, cylindrical and sometimes winged and forked at the base. The berries are round, transparent, yellow-pink through to gold in colour with a light bloom. They have tough skins and tender flesh, yielding large quantities of yellow juice with an undistinguished nose and rather neutral palate with a high acid level. In Italy new methods are leading to the production of a dry, fresh, varietal white wine with a low level of alcohol. However the juice from Ugni Blanc is more often blended with that of other white varieties such as Malvasia to produce white wines, or most often added to the juice of red grapes as in the production of many Chiantis. In France Ugni Blanc is generally blended with other varieties e.g. Clairette and/or Pascal Blanc in the white wines of Provence or with Sémillon in the Gironde. Furthermore up to 20% may be blended into the red wines of the area, especially those made from Mourvèdre and Petit Bouschet, to add to the body, finesse and keeping qualities of the wine. In Charente where the grape is commonly known as St Emilion, it is of particular importance as it is used in the manufacture of eau de vie as in the famous brandies of Cognac and, to the South, Armagnac. In Australia the variety is similarly used in the production of brandy or blended with other white varieties, and only rarely does it feature as a varietal wine. In Australia sometimes called Madeira in New South Wales. In Portugal also known as Gouveio or Vidonia. Verdelho is thought to have originated in Sicily and been introduced into Madeira possibly in the fifteenth century. From there it was probably introduced into the Douro Valley of Portugal and then to the Anjou region and the Loire Valley of Western France. Verdelho was imported into Australia in 1825 by the Australian Agricultural Company and plantings were established in New South Wales. By the 1850s in South Australia, Joseph Gilbert was growing Verdelho in the Barossa Valley, John Reynell in McLaren Vale and Frank Potts at Langhorne Creek. Verdelho is the dominant white grape of Madeira. It is found also in the Douro Valley of Portugal and the Loire Valley of Western France. In Australia there are plantings in New South Wales, South Australia and Western Australia, with the wines from Western Australia being particularly respected. The vine is moderately vigorous with a high yield. The leaves are of medium size, roundish, often 3-lobed, with a matt upper surface and with hairs on the lower surface. The bunches are winged, small and loose, made up of small, hard-skinned, oval berries which become golden in colour just as they ripen, producing a greeny-yellow sweet juice. The characteristics and richness of wine produced from Verdelho grapes will vary according to the climatic and growing conditions and the wine-making techniques used. The wine is usually aromatic, coloured, high in alcohol with a palate which can be rich, herbaceous, spicy and nutty with tropical fruit flavours. In Portugal Verdelho is used to produce fortified wines and it is a major component in the famous wines of Madeira. In France a dry white wine is produced. In Australia the rich, fruity but dry varietal wine is popular, particularly that from Western Australia. In the other states, Verdelho is more often blended to produce a longer-living wine and it is also used to produce fortified wine. None in Australia. In France Verdot is also known as Pienc, Fer Servadou, Petit Verdou or Carmelin. It is not to be confused with the similar but poorer quality Gros Verdot. Verdot has its origins on the right bank of the Garonne in South-Western France and is mentioned in eighteenth century French documents. Verdot was introduced into Australia by James Busby in his 1832 collection and Sir William Macarthur also trialled the variety in the 1840s. Plantings of Verdot are to be found in South-Western France, especially in the Médoc area. There are also plantings in Argentina, Chile and Australia. In Australia there are several widely scattered small plantings of the variety. The vine is quite vigorous but its yield can be inconsistent depending on the season. The leaves are long, fine, 3-5 lobed with a distinctive elongated central lobe and with a dark green, uneven upper surface and a paler, cottony lower surface. The bunches are below average size, cylindrical, long, winged and loose. The berries are small, round, dark reddish-black with thick skins and are late-ripening. Verdot produces a slow-maturing, long-living red wine with depth of colour, tannin, acid and an interesting, often spicy, fragrant bouquet. It has been an important constituent of many of the great wines of the Médoc in South-Western France. Verdot is similarly used in Australia to produce Bordeaux styletyle red wines and is also presented as a varietal wine. None in Australia. Also known in France as Vionnier, Viogné and Petit Vionnier. Viognier is known to have been present since Roman times in the Rhône area of South-Eastern France. In Australia the variety was imported by the CSIRO from Montpellier and the first commercial planting was made by Yalumba Wines of the Barossa Valley in South Australia in 1980. Viognier is not widely planted but is known principally as the variety used in the famous white wines of the Condrieu region and Château Grillet in the Northern Rhône Valley of Eastern France and for its contribution to the red wine of the Côte Rôtie, though there are recent plantings in the Languedoc-Roussillon region of Southern France. Very small plantings of Viognier are also to be found in the U.S.A.- especially California - and in Australia in the cooler areas of Victoria and South Australia. The vine is moderately vigorous in growth, producing leaves which are usually 5-lobed with a matt light-green upper surface and a lower surface similar in colour but with hairs on the veins. It is known for its unpredictability. The bunch is medium-sized and winged, cylindrical in shape and compact. The berries are small, oval, transparent, soft-skinned and golden on maturity, late-ripening, juicy and very sweet. 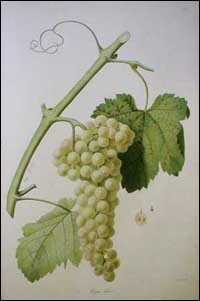 In France the Viognier grape is used to produce the varietal white wines of Condrieu and in particular Château Grillet. These wines, of very limited production, are rich, full-bodied, golden in colour with a dry, long-lasting, spicy, fruity palate reminiscent of apricots and oranges with floral overtones, but not usually considered to be long-living wines. Viognier juice is also used in the red wines of the Rhône Valley especially those from the Côte Rôtie, the Côte Brune and the Côte Blonde, where varying percentages of Viognier are added to Shiraz to give lightness, delicacy and perfume. In Australia small quantities of Viognier are produced providing a dry, fruity white wine with a smooth citrusy herbaceous palate. It is also blended with juice from Marsanne and Roussanne grapes to produce a Rhône-style white wine and with Shiraz to make a red wine..
None in Australia. It is probably the Primitivo/Primativo of Italy, also known as Taranto, and the Plavac Veliki of Yugoslavia and Dalmatia. Zinfandel probably entered the USA in the 1800s through the Eastern States and had arrived in San Jose, California, by 1859. It is probable that Zinfandel and Primitivo are in fact two clones of the same grape variety and Plavac Veliki a variety derived from Zinfandel and Dobricic and known also as Crljenak. However, Primitivo has been recognized as a variety in the Puglio (Apulia) region of south-eastern Italy for over possibly 200 years. Zinfandel is the second most planted red grape in California. In Italy Primitivo or Taranto is grown particularly in Southern Italy in Apulia and is still to be found in Yugoslavia and Dalmatia. In Australia, small plantings are mainly to be found in Western Australia and the MclarenSouthern Vales area of South Australia. The best quality grapes are produced from mature low-yielding vines. The vines are fairly vigorous and benefit from a climate which ranges from cool to hot but do not cope well with excessive heat. The bunches need careful treatment as the fruit can ripen unevenly and also shrivel in heat. Harvesting usually takes place comparatively early, but it may in particularly suitable seasons be late-harvested. Zinfandel produces a juice that may have high levels of alcohol and sugar, is well coloured and variously coloured, and has marked varietal characteristics. The quality and palate of the wine produced varies considerably according to the microclimate, altitude, time chosen for harvesting , the skills of the winemaker and the market to which the finished product is directed. VIALA, Pierre and VERMOREL,Victor. Traite général de viticulture. Ampélographie. Vols.1-V11. Masson. Paris. 1901-1910. RENDU, Victor. Ampélographie française. 2nd. ed. Masson. Paris. 1857. COSTA, B.C.Cincinnato da. Portugal Vinicola. Imprensa Nacional. 1900. MORTON, Lucie.T.,(trans) and GALET,Pierre. A Practical Ampelography. Comstock/Cornell University Press. 1979. MARES, Henri. Description des cépages principaux de la région Mediterraneénne de la France. Coulet. Montpellier. Masson. Paris. 1890. DION, Roger. Histoire de la vigne et du vin en France. Sevin. Paris.1957. BUSBY, James. Journal of a tour. Stephens and Stokes. Sydney. 1833. MACARTHUR, W.M. (MARO). Letters on the culture of the vine. Statham and Forster. Sydney. 1844. KERRIDGE, G. and ANTCLIFF, A. Wine grape varieties. Rev. ed. CSIRO. 1999. ANTCLIFF, A.J. Major wine grape varieties of Australia. CSIRO. 1979. BEESTON, John. Varietal Wines of Australia. Angus and Robertson/ Harper Collins. N.S.W. 1991. BEESTON, John. A Concise History of Australian Wine. 2nd. ed. Allen and Unwin. N.S.W. 1995. ROBINSON, Jancis. Vines, Grapes, Wines. Knopf. New York. 1986. ILAND, Patrick and GAGO, Peter. Australian Wine from the vine to the glass. Patrick Iland Wine Promotions. Adelaide, South Australia. 1997. BOEHM, E.W. and TULLOCH, H.W. Grape Varieties of South Australia. Dept. of Agriculture, South Australia. Adelaide. 1967. SUTHERLAND, George. The South Australian Vinegrowers Manual. Bristow, Government Printer. Adelaide. 1892. KELLY, A.C. Wine Growing in Australia. E.S.Wigg. Adelaide. 1867. McKAY, A.D., CRITTENDEN,G., DRY, P.R. and HARDY, W.J. Italian Winegrape Varieties in Australia. Winetitles. South Australia. 1999. RENOUIL,Y. and TRAVERSAY, P.de . Dictionnaire du vin. Feret et fils. Bordeaux. 1962. RANKINE, Bryce. Tasting and Enjoying Wine. Winetitles. Adelaide. 1990. LAKE, Max. The Flavour of Wine. Jacaranda Press. 1969. Australian and New Zealand Wine Industry Directory. 18th. Annual ed. 2000. Australian Industrial Publications. Adelaide. BULLEID, N. Alternative white varieties. Australian and New Zealand Wine Industry Journal. Vol 13.